Many forms of shamanic practice today are "living traditions"; that is, they have been practiced in a relatively unchanging manner for millennia by indigenous cultures. Even among peoples who have interacted with Western/European culture -- and survived the experience -- shamans continue in much the same way as they did long ago. In some cultures, the shaman is easily recognized primarily as a medicine man or women, a person whose role is clearly that of a spirtually-aided healer. 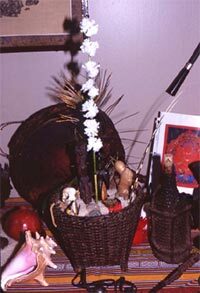 In other cultures, the shaman’s ceremonial functions may be more apparent and significant, so that the shaman is as much a priest as a healer. The roots of Tibetan culture lie deep in the archaic soil of Northern and Central Asian shamanism. This is also true today when most Tibetans are practicing Buddhists-- their Buddhism being a religious culture deriving from ancient and medieval India. 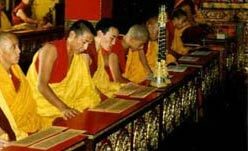 In Tibet, however, this Indian Buddhism has been amalgamated with the ancient indigenous shamanism and pagan animism of that country, thus giving Tibetan Buddhism its unique and especially colorful character. The principal function of the shaman is the healing of the illnesses that afflict the members of his or her tribe, and so one can rightly say that ancient Tibetan religious culture centered around the practices of healing. The therapeutic expert or professional in this regard was the Bonpo shaman-healer who treated and cured not only the diseases of the physical body, but more especially the illnesses of the soul, in order to bring the psyche of the afflicted individual back from fragmentation and alienation into wholeness and well-being. Furthermore, the shaman served the clan or tribe not only as a healer, but equally as a guide for the human soul on its journey beyond the present life through the perilous Bardo into its next rebirth. The shaman was able to function as a healer and a guide of souls pre-eminently because of his or her mastery of alternate states of consciousness, "the archaic states of ecstasy", so that one could voluntarily enter the Otherworld of the spirits, a non-ordinary reality parallel to our familiar world of the senses and its conventional reality. The shaman could thus enter into and explore the landscapes of the mind, the collective unconscious psyche, and return thence with treasures of knowledge and power in order to benefit humanity.